A collection of fun short stories about British cars, auto repair, and being on the road in the western US. 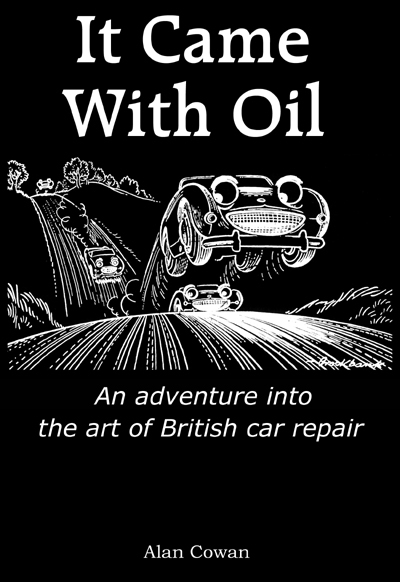 "An adventure into the art of British car repair", by Alan Cowan. There are true stories about Triumph through Land Rover, Jaguar through Morgan, Norton motorcycles and small airplanes, and so much more. Currently in print, and available through Amazon, Barnes & Noble, etc, and direct through the Publisher, we no longer offer this book on this site. 240 pages, illustrated, tangible paper-book. VBW Publishing, College Station, Texas. ISBN 978-1-60264-814-2. Copyright 2011.